On the evening of Tuesday 16 July, the 33rd day of the anti-government demonstrations in Bulgaria, hundreds of protesters gathered in front of the German embassy in Sofia. There, in a symbolic gesture, they built a ‘Berlin Wall’ made of cardboard boxes. Then, with a good shove and much cheering and applause, they proceeded to tear it down. Peppered with Bulgarian flags, as well as a few German and European flags, the crowd of protesters sung ‘Ode to Joy’, the European Anthem, after the wall fell. The wall – which had the word ‘Mafia’ and the names of the political parties in Bulgaria’s Parliament written on it – symbolised the government’s ties with murky oligarchs, Bulgarian press agency Novonite reported. “It’s a sign that there is a very living civil society [in Bulgaria],” the diplomat added, visibly moved by the symbol. The tearing down of the replica of the Berlin wall was actually a thank you note to the German ambassador. On July 8, the French and German ambassadors, Philippe Autié and Matthias Hoepfner, issued a statement saying that “an oligarchic model has not place” in the European Union, where Bulgaria is its poorest member. The ambassadors also said the rise of Bulgarian civil society was “excellent news [that] deserved to be listened to”. The joint statement was an unprecedented instance of major European governments commenting on the situation in Bulgaria. “The French and German ambassadors’ joint statement is as clear and as strong as it gets – even unusually strong for a diplomatic document,” Bulgarian author Iveta Cherneva told euronews. On July 17, Autié visited the demonstrations in Sofia and talked to some of the protestors, local media report. To thank France’s ambassador, on July 13, a group of demonstrators had re-enacted ‘Liberty Leading the People’, a 1830 Eugene Delacroix painting, complete with 19th-century costumes and antique rifles. “Europe, where are you? Freedom! Revolution!” screamed Tania Ilieva, the model playing the mythical role of the bare-chested goddess leading the revolutionaries in Delacroix’s painting, AFP reported. Ilieva brandished both the Bulgarian and European flag as thousands of demonstrators chanted “Resignation!” in front of the government’s offices. One of the organisers of the “tableau vivant”, spoke to AFP about their motivation “We want to congratulate France for the anniversary of the Big Revolution. [Delacroix’s painting is actually a reference to the 1830 July revolution, not the French Revolution’s Bastille Day]. We also want to thank France for understanding our protests against the oligarchic form of government”. Demonstrators also thanked the French ambassador by gathering in front of the French embassy in central Sofia. On the same day, the Dutch ambassador Karel van Kesteren showed support of his European colleagues and said in an interview that Bulgarians “protest in the name of ideals and principles”. Van Kesteren also said that Bulgaria’s current political climate challenged the country’s joining the Schengen area.“When you want to give the key to your neighbour, you have to trust him,” the diplomat said. No public actions have yet been taken to thank the Dutch and the Belgian ambassadors. In the meantime, the leader of the Bulgarian extremist nationalist Ataka party, Volen Siderov, a de-facto legislative ally of the majority in parliament, called on Bulgarian Foreign Minister Vigenin to take action against foreign diplomats in the country, Novonite reports. Similarly, Bulgarian Socialist Party MP Tatyana Burudzhieva told local radio K2 the German and French ambassadors should be recalled as any other country would have already done so. The repeated appeals to Europe, the ambassadors’ comments and the strong reactions they triggered, underscore that, after weeks of daily anti-government demonstrations, there is still no end in sight for the political crisis in Bulgaria. Over time, the protesters’ demands have broadened, from the cancellation of a controversial nomination to calls for the government to resign, as well as the end of what they call the oligarchy and the Mafia’s meddling with the country’s public affairs. The domestic situation is deadlocked. The embattled minority government, backed by the Bulgarian Socialist Party and its allies, refuses to budge while GERB, the main opposition party, has repeated it will not attend parliamentary meetings unless they concern Election Code amendments or a date for new snap elections, Bulgarian press agency Novonite reports. But Plevneliev’s power is limited, The head of state decides election dates, but he cannot organise new elections unless the government resigns or the parliament agrees to dissolve itself. On a European level, politicians and institutions are divided, to say the least, on a response to the political crisis in the EU poorest member state. 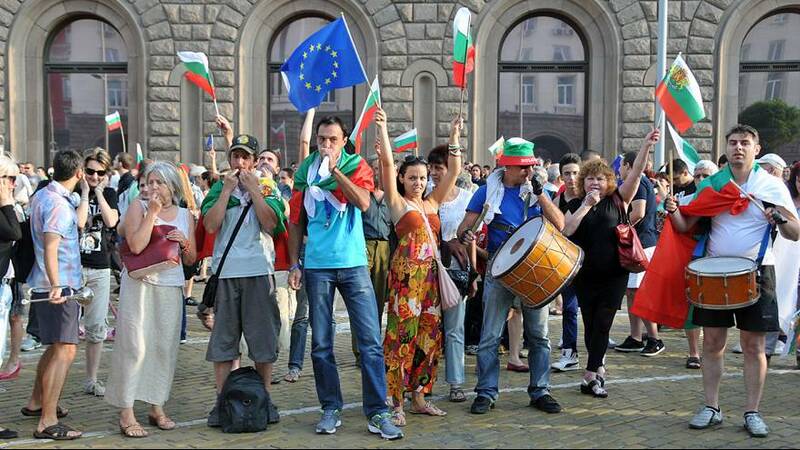 On July 2, a plenary debate on the situation in Bulgaria turned political. The conservative EPP group denounced what they see as a “socialist double standards” and European socialists “turning a blind eye to glaring breaches of human rights”. “For the European Socialists, human rights can be violated if they are violated by a Socialist government,” said Manfred Weber MEP, Vice-Chairman of the EPP Group, in a statement. The EPP underlined the contrast with “the deliberate aim [of the S&D group] of humiliating EPP-led governments.” On the same day, the previous debate saw the S&D attack the EPP-backed Hungarian government. The conservatives also criticised the reliance of the BSP-led majority “on the parliamentary support of the ultra-nationalist, xenophobic and anti-EU party” Ataka, as well as recent government appointees. The EPP is not alone in its criticism of the European socialists. Their leaders are a regular target of signs and banners in the demonstrations. The leader of the Party of European Socialists is the Bulgarian Sergei Stanishev, who is also the leader of the BSP, the main party backing the government. “We are disillusioned with the European Parliament’s Socialists — an institution, which is supposed to be a beacon of European Democracy and instead compromised on their European values,” Bulgarian author Iveta Cherneva told euronews. “By supporting the socialists in Bulgaria which can only stay in power if they are in coalition with a party advocating for getting out of the EU,” she added. On June 22, the PES leadership, including European Parliament S&D president Hannes Swoboda, gathered in Sofia for the party’s Council, as several hundred people assembled to protest against Stanishev. The PES Council was seen by many as a show of support to Stanishev, the BSP and the Bulgarian government. Novonite reported that they expressed strong support for the efforts of the Bulgarian Socialists and the Oresharski cabinet in their efforts to overcome the political and economic crisis in Bulgaria. The S&D president dismisses the criticism voiced by the EPP and others, and pinned the blame on EPP-backed conservative GERB party. The European Commission, poised to release an oral report on Bulgaria’s progress in the spheres of justice and home affairs on July 18, appeared unlikely to comment on the political situation. “The verbal presentation (…) will be factual and will not comprise any political assessments,” Mark Gray, a EC spokesman said. Gray also dismissed suggestions that the EC will recommend a postponement of Bulgaria’s entry into the Schengen border-free area by at least a year due to its unsatisfying progress and raging political crisis, according to Novonite. Bulgaria is bound to remain in the EC’s focus. European Justice Commissioner Vivian Reding is expected to start a two-day visit to Bulgaria on July 22. He advocates the pursuit of the monitoring of the Copenhagen criteria – criteria countries must meet to enter the EU – after a country enters the EU. “We were very naive, as if the entering countries would always have good democratic behaviour,” he told euronews in a phone interview. “My worst nightmare would be a fundamental rights crisis in the European Union where European Parliament political groups would have a gentleman’s agreement” and not attack each other’s problematic governments, Tavares concludes.